The PSS 7000 has been designed for maximum comfort and stability during use in harsh fire fighting environments. Incorporating a rigid harness connection to a 3-point-height adjustment backplate, advanced harness materials and a pivoting waist belt, the PSS 7000 remains firmly in position regardless of the task in hand. 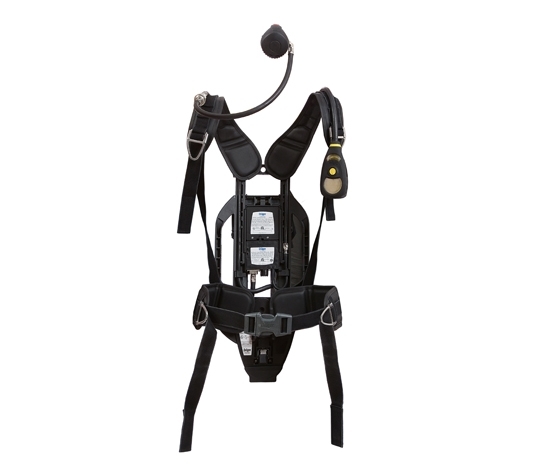 The PSS 7000 utilizes new state-of-the-art harness materials which have been specially designed to withstand the high level wear and tear fire fighters subject them to on an almost daily basis. Incorporating sturdy stainless steel buckles and long-life Aramid blend webbing, it is well suited to extended wear and frequent use. Dräger’s innovative “slide and lock” harness mechanism facilitates fast and simple harness and waist pad connection/removal from the backplate without the need for tools. The first stage reducer snap fit connection allows the pneumatics to be fitted or removed quickly and easily from the SCBA. Push in and out” hose clips allow rapid removal of hoses from the harness pads for cleaning without the need to remove the clip itself. Closed, single piece harness and waist pad design to prevent excessive water absorption, reducing cleaning and drying time. To minimize the risk of snagging and to protect against physical damage, both gauge and air supply hoses are run through integrated channels in the PSS 7000 backplate. The LDV, gauge and rescue hoses can now be routed over the left and/or right shoulders (2 hoses per side), allowing the PSS 7000 to be configured to any standard. Conventional waist mounted hoses can also be fitted, making the PSS 7000 one of the most versatile SCBA’s available. The Dräger Quick-Connect is a revolutionary, fast-action cylinder exchange system which features a dual mechanical and pressure seal safety mechanism designed to prevent accidental cylinder disconnect from the SCBA. The pressure seal locks the cylinder to the SCBA while the system is pressurized. The mechanical seal requires a dual action, twisting push motion to remove the cylinder from the reducer. With Quick-Connect, a cylinder can be securely attached to the reducer with a simple push down action. Exchange times can be reduced from minutes to seconds which can make all the difference in an emergency situation. The danger of cross threading or thread stripping is eliminated, and workshop maintenance is greatly facilitated. The PSS 7000 has been designed to be fully compatible with the globally established Dräger Bodyguard 7000 electronic signal and warning unit as well as the PSS Merlin telemetry system. The Dräger Bodyguard 7000 features an integrated design concept which integrates both power supply and pressure sensor modules within the backplate. This not only creates a balanced weight distribution, but also provides maximum component protection. Real-time monitoring of essential information such as time to whistle (based on current air consumption) and cylinder pressure is communicated via a lightweight, handheld electronic gauge and display and/or by a facemask-mounted head up display (HUD). This information can be simultaneously transferred to the PSS Merlin Entry Control Board or the PSS Merlin Entry Control Software via the PSS Merlin Modem, further enhancing fire ground safety.